I bookmarked the recipe a million years ago and i only baked this last weekend. The perfect combination: Pandan + Coconut. What can be better than this? The fragrant smell of the pandan cake absolutely filled my living room while it’s baking in the oven. My chiffon cakes are always so short. I guess partly is because of my chiffon tin. I have been wanting to get a higher chiffon tin but i just couldnt bear to spend that few bucks since this is still working well. Just that my current tin is shorter and wider? Hmm. Chiffon cakes. They looked no big deal at first sight. In fact, they are the opposite. In my opinion, i think they are harder to tackle compared to cupcakes and muffins. I guess to bake anything successfully, its essential to understand the objective behind the steps! Sadly, I am still far away from mastering chiffon cakes. This is my 4th attempt baking chiffon cakes! Check out my coffee chiffon cake here. 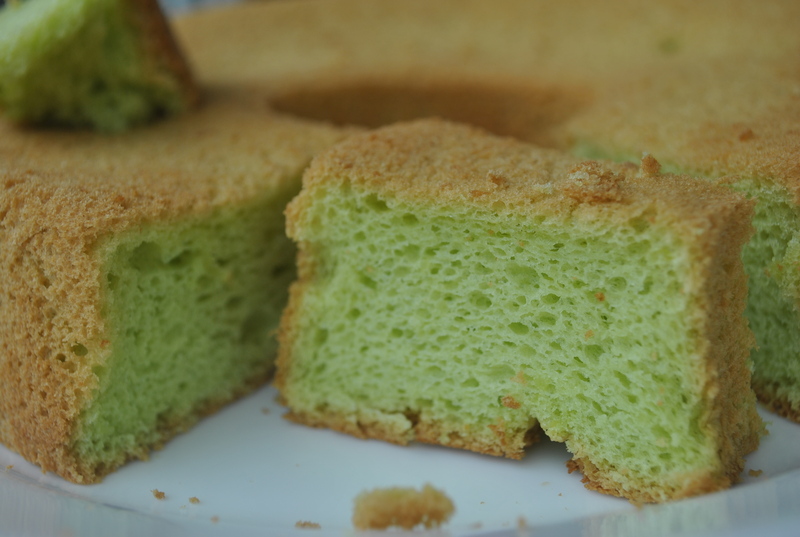 Back to my pandan chiffon cake, its a little too moist. The problem lies here. Original recipe calls for 1tbsp of homemade pandan paste. I didnt want to use the artificial pandan paste bought in stores, so i dilligently pound my pandan leaves. However, it requires a long time ( about a day) for the pandan solution to settle because we only want the concentrated part of the pandan solution. I was too excited and couldnt wait for a day so i substitute that with 75 ml of my pounded pandan solution. My cake ended up slightly too moist but the pandan taste was fantastic. Since this was my 1st attempt with Pandan Chiffon, i decided to use the instant coconut milk from the store. But i believe that fresh coconut milk will certainly provide a better flavour. 1. Whisk egg yolks, sugar and salt until the sugar dissolves. Put coconut milk in saucepan and let it simmer under low heat for about 2-3 mins. 2. Gradually add in vegetable oil, followed by coconut milk and pandan paste, and stir until well-mixed. 3. Fold in sifted cake flour and baking powder until well-mixed. Set aside. 4. In another bowl, whisk egg whites until soft peaks form. Add in sugar gradually and continue whisking until stiff peak form. 5. Gently fold in the egg white into the egg yolk batter (in step 3) in 3 batches. 7. Remove from oven and invert the tin immediately onto a cooling rack. 8. Unmould the cake only when it is completely cool. I met my cousins for dinner today. 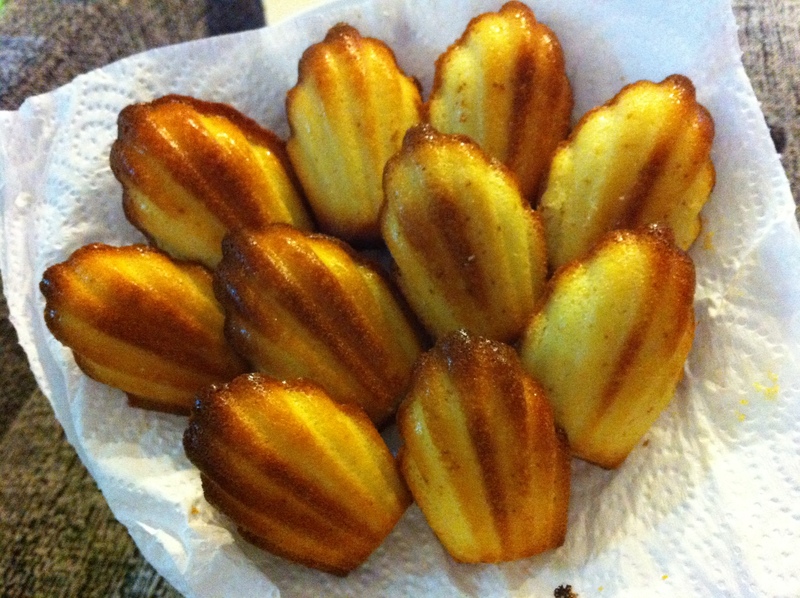 Yesterday night, I was all hyped up and prepared a batch of three different flavours of madeleines for my cousins. HOWEVER, I WAS SO CARELESS THAT I LEFT THEM AT MY WORKPLACE. I only realised it while i was already halfway through the journey. How can i be so careless right. Thankfully some of my colleagues are working OT tonight. So, they helped to finish the madeleines. If not, they’ll end up in the dustbin on Monday morning. I have been wanting to experiment different flavours of madeleines after my previous attempt baking lemon madeleines. I really adore these little french cakes. 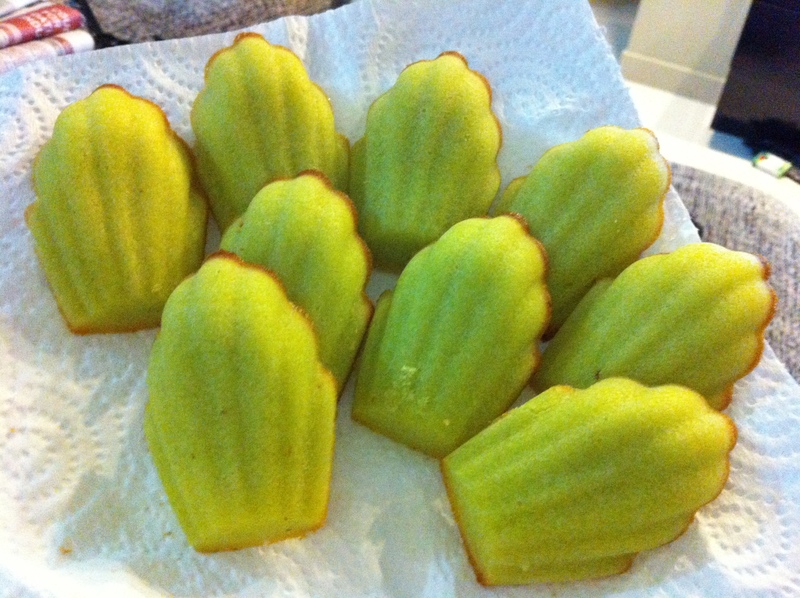 Soft & Moist Pandan Madeleines. 1) Preheat the oven to 350 degrees, spray 2 Madeleine pans with non stick cooking spray and set aside. 2) Pound the pandan leave and add 1/2-1 tbsp of water s and squeeze them through a strainer. Dispose the residue. 2) In the bowl of a standing mixer fitted with a whisk attachment, cream together the eggs and sugar for 3 to 4 minutes on high speed or until the mixture thickens and develops a light pale color. 3) Add the vanilla,coconut milk pandan extract,, flour, salt and baking powder and turn mixer down to low and slowly stream in the melted butter. Mix until everything is well incorporated but don’t over mix. 4) Divide the batter evenly in the pan (do not over fill) and bake for about 8 to 10 minutes or until lightly golden and brown around the edges. NOTE: Pandan Madeleines. Overall, they are pretty fragant but i guess the pandan flavour can be further intensified. I’ll pound more pandan leaves and extract more juice. This is too sweet for my liking. I’ll reduce the sugar level in future. I know they look kinda oily but they are not! They are just shinny?!? which i have no idea how they became like this. As compared to the pandan madeleines, they are chewier and rounder despite filling each madeleine pan with the same amount of batter. Does anybody knows why? Is it due to beating of the egg whites?Hmm..
1.Preheat oven to 170C. Sift together flours, milk powder and baking powder. Combine honey and hot water in a bowl. 2. Place butter, cream and vanilla in a heatproof bowl. Place over a pot of simmering water and heat, stirring until butter has melted. Set aside. 3. In another heatproof bowl, beat eggs and salt with a whisk until yolks break. Add sugar and place the bowl over a pot of simmering water and mix well. When egg mixture is warm, use an electric mixer to beat on high speed unti light and fluffy, about 5 mins. Reduce speed to medium and continue beating for abt 1 minute. Add honey and mix well. 4.Gently fold in flour mixture with a spatula. Add cream and butter mixture and fold until just incorporated. 5.Spoon batter into a piping bag and pipe into paper cups or greased madeleine pans. Bake for about 25mins until madeleines are light golden in colour . Cool on a wire rack . Store them in an airtight container at room temperature for up to 5 days. Note*: They do have a strong taste of honey. Milk taste isnt too strong. You probably could adjust it according to your liking. Recipe is the same as the prvious batch of madeleines i baked except that i replaced lemon with Orange. Orange Flavour could further be enhanced. Prolly add more peel and orange juice into the batter. 3) Add the vanilla, lemon zest, flour, salt and baking powder and turn mixer down to low and slowly stream in the melted butter. Mix until everything is well incorporated but don’t over mix.